Penguin Random House South Africa has launched Partridge Africa, a supported self-publishing service. Following launches in India last year and in Singapore last month, Partridge is now available locally, to help aspiring writers with everything from cover design and layout to online and print distribution. Partridge Africa is dedicated to preserving this great continent’s vibrant culture and storytelling history while supporting its burgeoning population of talented writers. We provide authors like you the opportunity to publish your work here and abroad. Share your stories with the world through one of the industry’s leading purveyors of publishing and book marketing services. Let Partridge Africa’s team of experts guide and support you in your publishing journey. The idea of publishing a book can be intimidating, especially for first-time authors. Fortunately, with Partridge Africa on the scene, publishing a book in Africa has never been this easy. Partridge Africa represents the coming together of two expert publishing institutions: Penguin Random House, known as the world’s foremost trade book publisher, and Author Solutions, one of the leading and most experienced providers of supported self-publishing services. Partridge Africa’s depth of experience is complemented by its wide spectrum of publishing services. We offer comprehensive publishing packages and options that match your ambitions as an author while also ensuring that you keep complete control over your book. Celebrate Africa’s storytelling tradition by self-publishing your book with Partridge Africa. Get your FREE self-publishing guide by clicking here. Call a Partridge Africa consultant today on 0800 990 914 (toll-free in South Africa) or +44 20 3014 3997 (outside South Africa) or send an email to publishing.africa@partridgepublishing.com for a FREE consultation. Penguin Books South Africa is delighted to announce the completion of the first phase of our e-book roll out in which most of our titles have been made available as e-books. Going forward we will be releasing new titles in e-book format at the same time as their release in printed form. The bulk of our backlist, counting almost 200 titles, have now been published as e-books and, together with the new titles, are for sale through all major vendors inside and outside of South Africa, depending on which territorial rights we hold for each title. While the first phase included only text-based books, such illustrated books as allow for suitable conversion for tablets, will be published as e-books during the next phase. “This is a significant stride forward for Penguin and the authors we publish in South Africa. In the greater world of books there is a growing consensus that the future of books will be a creative coexistence of printed and digital books, and the prospect of seeing our titles in digital format reach across the globe is the source of great excitement for us,” says Frederik de Jager, Publisher for Penguin Books SA. Meet Jo de Villiers, mother of two small children, wife of the charming and handsome Nick, and scriptwriter for a local soapie, Jozi Nights. Her day consists of toddler tantrums, dirty nappies, leaking breasts, potty training, the nursery-school run… In between she squeezes scriptwriting meetings and her writing assignments. She also has to deal with a boss from hell, a self-centred mother, an overly genteel mother-in-law and the Blonde Bob Brigade (mothers at the school). On top of all this, Jo suspects that Nick is having an affair with his PA, Susie the Floozy. Racy, witty, often hilarious – suburban life with small children has never been so entertaining. Pamela Power was born in Pietermaritzburg, and educated in Zimbabwe, Johannesburg and Pietermaritzburg. She trained as an Aids counsellor and worked with a drama-in-Aids-education company and got involved in stand-up comedy. She has worked as a director and scriptwriter on South African television shows Top Billing, Generations and Muvhango. In addition to her writing work, Power co-owns a guesthouse in Melville, Johannesburg. She is married and has two children. eKhaya, the digital imprint of Random House Struik, is delighted to announce the publication of Bloody Parchment: Inferna and other stories. 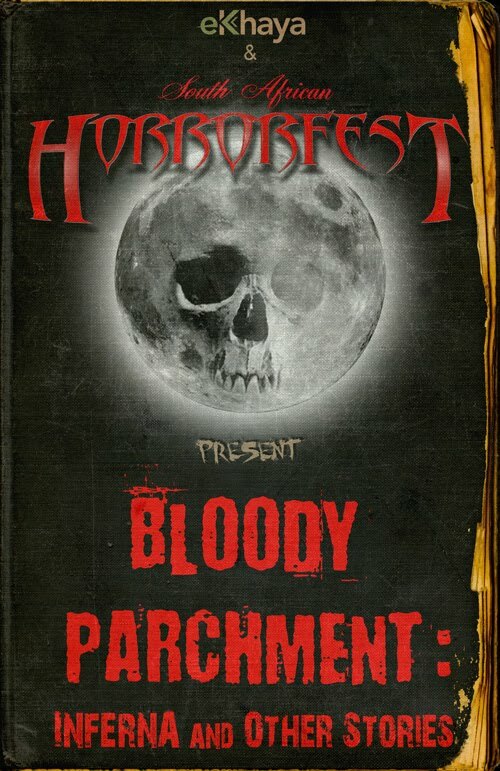 Bloody Parchment is the literary component of the annual South African HorrorFest held in Cape Town, South Africa, each October. The Bloody Parchment short story competition was established in 2010. Edited by prolific Cape Town writer and editor Nerine Dorman, Inferna and other stories is the collection of the winning story from the 2011 edition, ‘Inferna’ by Christina Vincent, runners-up Brett Bruton and Jenny Robson, and finalists by Mico Pisanti, Lee Mather, Stacey Larner, Toby Bennett, SL Schmitz, Benjamin Knox, Austin Malone and Joan De La Haye. The authors of the collection represent a fine international mix of writers from South Africa, the United States, the United Kingdom, Botswana and Australia. With the success of films like District 9 and Lauren Beukes‘s novel Zoo City, the burgeoning South African genre scene is coming to hungry international attention. eKhaya believes that the Bloody Parchment short story competition is the ideal hothouse to nurture new international genre voices and to encourage cross-pollination between emerging South African and overseas talent, and ultimately develop and encourage indigenous horror stories that appeal to a broad international market. Bloody Parchment: Inferna and other stories is the sort of cutting-edge book eKhaya is looking to publish in its savvy, electronic format and we look forward to a productive association with the South African HorrorFest. Bloody Parchment: Inferna and other stories will be released on 1 June 2012 at a recommended retail price of just R70. It will be available as a PDF and ePUB from South African online retailers Kalahari.com and Exclus1ves.co.za, and from Amazon.com internationally. Betrayed by love, Rupert Richter wants more than anything to be free of intimacy. His wish is granted when he sells mineral rights on his Karoo farm, making him rich enough to retire from society. His sudden wealth, however, draws unusual attention. When he’s asked to act as bait for a syndicate who defraud people of their fortunes, Rupert refuses to be part of the plot. He closes his bank accounts, sells all his assets and cycles into the African sunset. Except…Rupert has unexpected appointments with fate. His quest for peace is plagued by high drama and beautiful women. After a road accident, he finds himself fighting for his life and, as if injuries and abductions are not enough, his own heart refuses to follow his solitary path. Conrad Schultz is the pen name of an architect living in Clarens, South Africa. He is married with three children and is an alumnus of the Random House Struik Creative Writing Course. This course is presented by GetSmarter, an online education provider which uses an advanced and user-friendly model to reach students in many parts of the world. Visit www.getsmarter.co.za.